Zion National Park, is one of the gems of the Southwest. 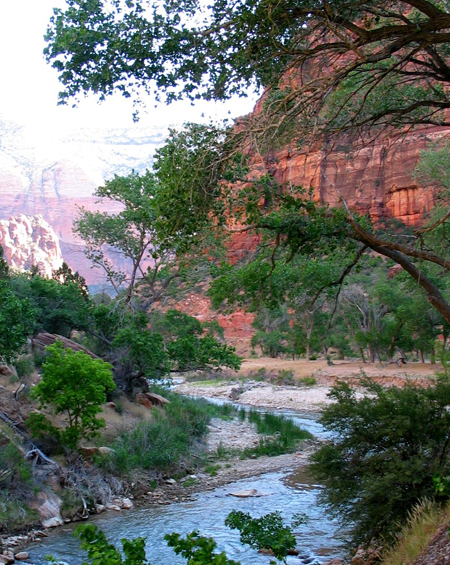 With soaring cliffs and plenty of outdoor activities, Zion is a must-do. This beautiful national park, located not far from St. George, Utah, is accessible via the Las Vegas Airport, less than two hours away. I enjoyed hiking in Zion one summer and have fond memories of the sometimes treacherous “Angels Landing” accessed via “Walters Wiggles.” I hiked up slowly, at my own pace and stopped many times to photograph the impressive landscape. If you can, try to take a hike in one of the canyons or climb to a lookout where you can get a bird’s eye perspective on Zion’s beauty. Zion National Park’s red rocks are part of the expansive Colorado Plateau. Zion National Park is open year round. Due to weather, the majority of park visitors come during Spring and Fall. And, you don’t need to be a hiker to enjoy the scenery. 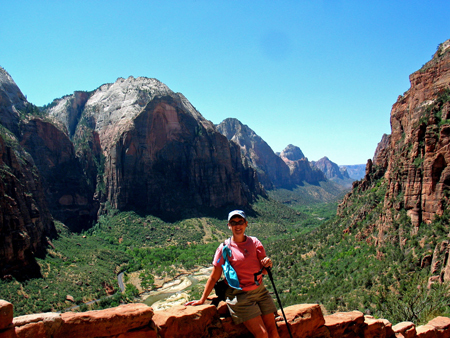 Even those with physical limitations can enjoy Zion. The restrooms, visitor’s centers, shuttle, museum and Zion Lodge are fully accessible. You can ride through the park. A shuttle takes visitors on a loop trip (90 minutes round-trip) throughout the park April 1st through October 29th. In general, cars are not permitted past the Visitor’s Center during these peak times. The Springdale Shuttle, bringing visitors into the park, stops at six locations in Springdale so you can leave your car there. 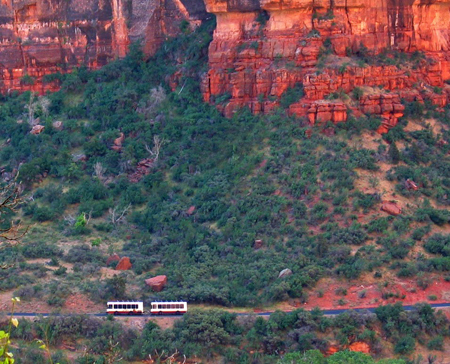 The Zion Canyon Shuttle loop stops at eight locations in the park. 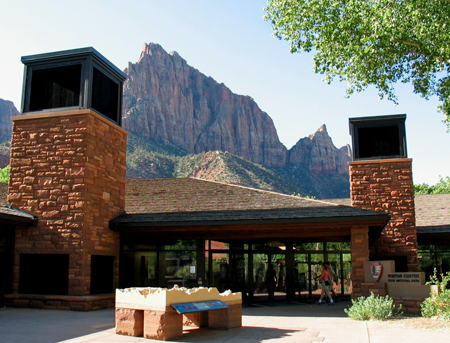 The transfer between loops is made at the Zion Canyon Visitor Center. You may get on and off as often as you like. Riding the shuttle is free. Museums and Education – The Visitors Centers have displays and a great selection of books. The Zion Human History Museum permanent exhibits display the rich human history of Zion National Park. The museum showcases American Indian culture, historic pioneer settlement, and Zion’s growth as a national park. The Visitors Center has a great shop with an excellent selection of books, great souvenirs and beautifully designed t-shirts. Proceeds go to the park. Watchman Campground, South Campground and group campsites are available for RV and tent camping. There is also backcountry camping. Zion’s backcountry is a primitive area and managed according to regulations that protect its wilderness values. Backcountry camping is allowed on a limited basis and a backcountry permit is required. Permits cost $5.00 per person per night. Group size is limited to 12 persons for both day and night use. Campfires are not permitted in the back country. More Camping Information. Zion Lodge – Zion Lodge is open year-round. Reservations are advised. Motel rooms, cabins and suites are available. Zion Lodge also has dining, a gift shop and post office. This is the only place to stay within the park boundaries. Zion Lodge Website. Lodging Outside the Park – You can stay in Springdale or in St. George for easy access to the park. When we visited, we stayed at Cedar City.